After visiting the optometrist, a seventh-grader discovers that he can control people’s minds in this comic middle-grade novel. 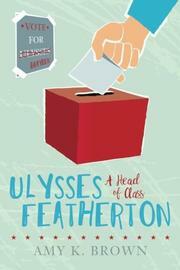 It’s Ulysses Odysseus Featherton’s 12th birthday, but he doesn’t have much to celebrate. His overly conscientious parents give him unappetizing health food and annoying vocabulary tips in equal measure, and he isn’t exactly the most popular kid at Sunnyvale Middle School; that would be Brayden Flanagan, sports star and shoo-in for seventh-grade class president. No one else is even bothering to run—until Brayden nominates Ulysses as “the weakest, the least popular, the one he was guaranteed to crush in a landslide victory.” Ulysses accepts this, as he doesn’t mind losing so much, but the idea of speaking on stage in front of everyone terrifies him. Today, on his birthday, Ulysses must visit the optometrist, but a substitute is filling in for his usual doctor. Dr. Egnarts (spell it backwards) puts drops in Ulysses’ eyes that somehow allow the boy to make people do the opposite of whatever their intentions are. He uses this power to get junk food for dinner and get out of gym class, which is great—but even better, he can now defeat Brayden. Ulysses discovers, though, that his hunger to win makes him as much of a bully as Brayden ever was. He learns something about himself and gains an unexpected ally. Debut author Brown gives readers an appealing hero with an engaging moral dilemma. At first, Ulysses feels justified in manipulating others, but Brown shows how becomes troubled by his actions: “I had decided that it was somehow more honorable to talk my way into getting what I wanted rather than blink my way into it.” Just because he’s been bullied in the past, Ulysses isn’t portrayed as automatically being in the right, and by the same token, Brayden’s character—at first, a stereotypical middle school bully—is revealed to have surprising, hidden depths. It’s a nice twist, for example, that Brayden has better, more concrete ideas to improve the school than Ulysses does. And Ulysses’ comical, often rueful first-person voice is a big plus as well. An enjoyable, funny novel with a thoughtful ethical underpinning.